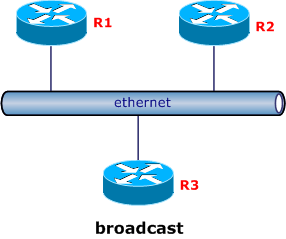 Ethernet technology is a typical example of broadcast network where a transmitted packet is multiplied by ethernet switch and copies of this packet are transmitted to all end points. In this scenario OSPF Hello, LSU (link state update) and LSAck (link state acknowledgement) packets are transmitted in multicast mode. DD (database description) packets and LSR (link state request) packets are transmitted in unicast mode. OSPF routers in broadcast network elect designated router (DR) and backup designated router (BDR). Only DR and BDR form adjacencies with all non-designated OSFP routers. 224.0.0.5 and 224.0.0.6 are multicast IP addresses reserved for all OSFP routers and OSFP designated routers respectively. 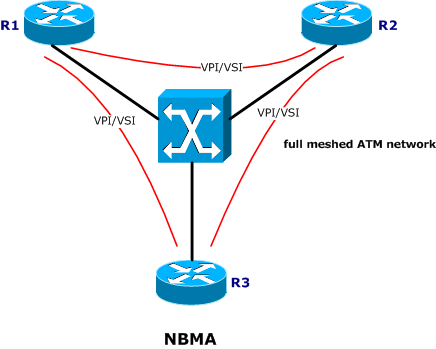 ATM and Frame Relay are typical examples of NBMA networks. NBMA simulates broadcast network. It must be full meshed and every router in the segment must be configured with IP address of each of its neighbours. In NBMA networks all OSPF packets are transmitted in unicast mode. DR and BDR routers are elected as well. The common practice is to change non-full meshed NBMA network to a P2MP network. 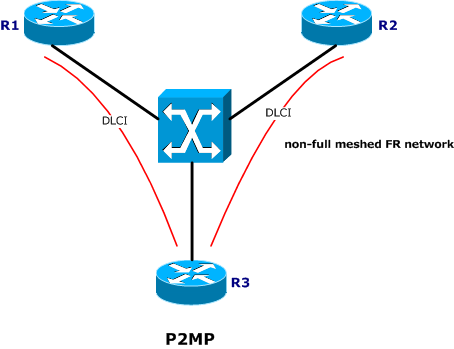 Non-full meshed FR network is P2MP network example. A P2MP network, unlike full meshed NBMA networks, is a collection of point-to-point networks. As this is P2P, DR and BDR are not needed. OSPF network type must be manually configured because the network is not fully meshed. Inverse ARP should be configured on an interface. Hello packets are transmitted in mulitcast mode through the mulicast IP address 224.0.0.5. Other OSPF packets are transmitted in unicast mode. In this type of networks, OSPF protocol packets, such as Hello, DD, LSR, LSU and LSAck packets, are transmitted in multicast mode using 224.0.0.5 multicast address. As this is a link between exactly two points, each packet sent from one router have only one recipient on the local link.